Wisconsin's first state park offers one of its finest paddling opportunities. For starters, it's filled with beautiful sights of the Dalles of the St. Croix River as you paddle through a basalt gorge with Minnesota to the west and Wisconsin to the east. Second, it's actually managed by the National Park Service, as a part of the St. Croix National Scenic Riverway. While Wisconsin isn't home to any proper National Parks, it does offer some federally protected lands like this that are very picturesque. Bring your own boat or rent from a local rental place, and launch from Interstate's boat landing. While Midwesterners may be considered flatlanders, the Driftless region of Wisconsin is full of many tall bluffs and Perrot is home to two of them, Brady's Bluff and Trempealeau Mountain. 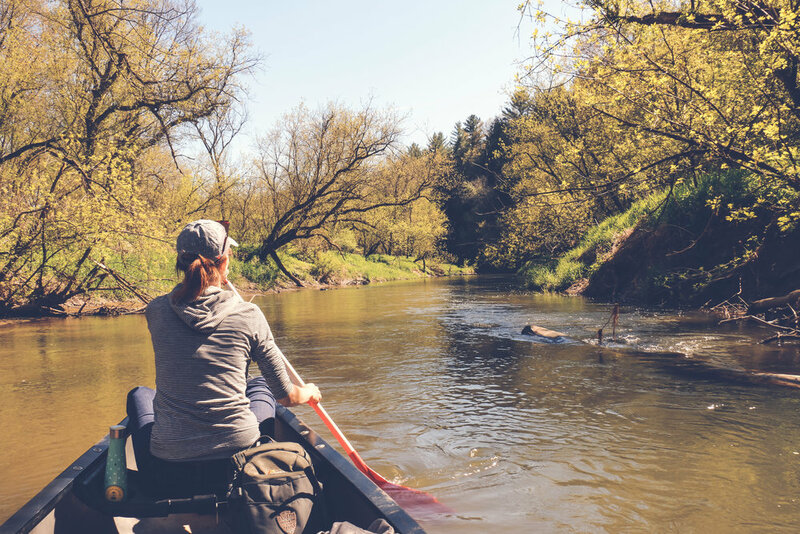 Perrot marks the breathtaking confluence of the Trempealeau and Mississippi Rivers, with a canoe/kayak launch in the park that allows you to paddle the 3.4 mile Voyageurs loop through the Trempealeau River backwaters. The wildlife in this area cannot be understated. With beaver, muskrats, mink, otters, and over 200 species of birds, your paddle will be filled with many animal friends to admire. Rent from the state park headquarters or bring your own kayak/canoe. The Kickapoo river flows through beautiful Wildcat Mountain State Park in Ontario, Wis. It's named after the Kickapoo tribe that occupied this area before white settlers. The name Kickapoo means "one who goes here, then there" and likely refers to the migratory patterns of the tribe. But giving this river the same name seems a bit ironic and once you start paddling, you'll understand why. The narrow river winds back and forth for miles, making for a fun paddle that can last for hours. So if you're looking for a day on the river without having to go too far, the Kickapoo is a perfect choice. Bring your own boat or rent from an outfitter in Ontario. Mirror Lake is a quiet body of water with a no-wake zone throughout. Its still and glassy appearance reflects the trees and sky like a mirror, giving way to its name, and making it a great lake to paddle. Two State Natural Areas exist within the park, so as you paddle through the narrow portion of the lake, you'll pass by the sandstone cliffs of Mirror Lake Pine Oak Forest State Natural Area to the north and Fern Dell Gorge State Natural Area to the south. The views and the wildlife (you might spot a muskrat or two) make it worthwhile. Rent canoes, kayaks, and paddle boards at the boat launch within the park. Or bring your own for a relaxing paddle! Whitefish Dunes, located on beautiful Lake Michigan, protects the best sand dunes on the western shore of Lake Michigan and rare plant life. With its brilliant turquoise waters, it is truly a sight. Launch from the sandy, cresent beach of Whitefish Dunes State Park and head north. 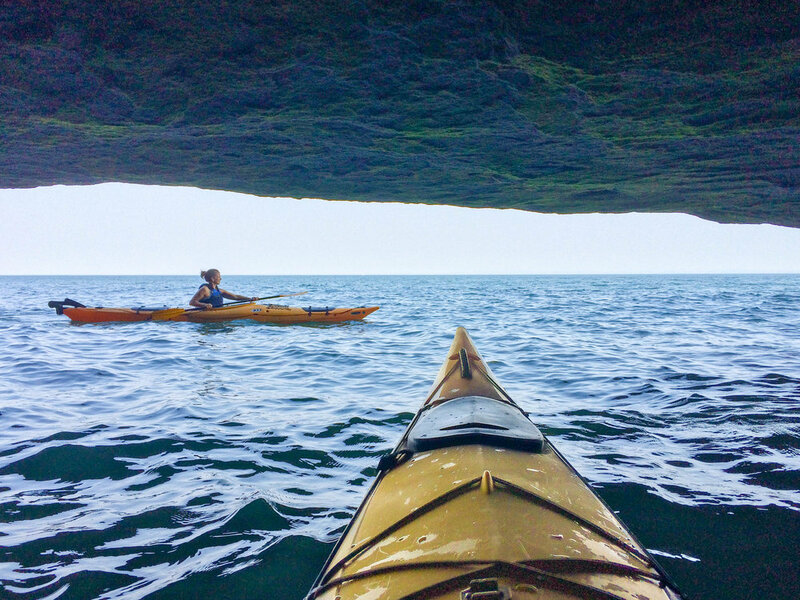 After a quick half mile, you’ll be greeted by the aptly-named Cave Point, where the limestone escarpment has slowly eroded away to form natural sea caves that you can meander in and out of on a calm day. Here the water of Lake Michigan is often dazzlingly clear, clear enough, some days, to see the remains of the Australasia shipwreck resting below you. Pause on the beautiful outcropping of Cave Point for a snack, swim, or snorkel before heading back to the beach. Bring your own kayak or take a guided tour with a local outfitter. 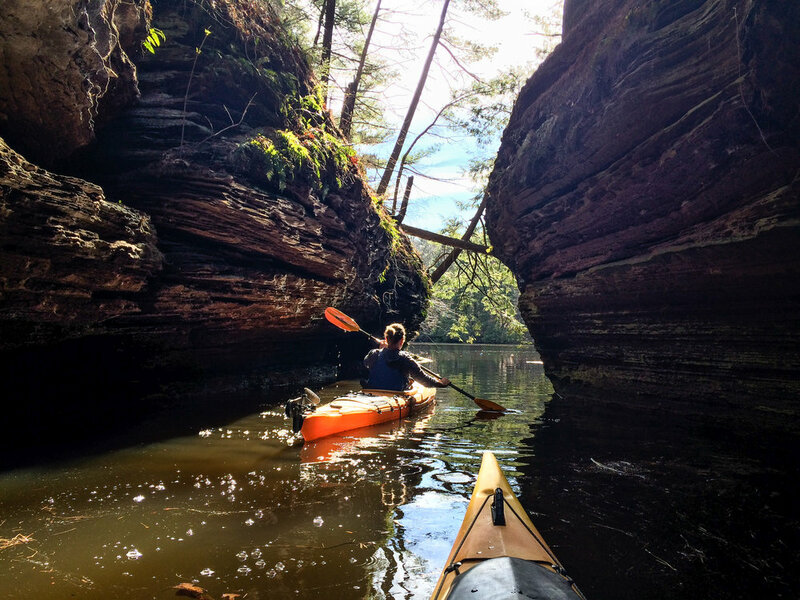 Paddle along Wisconsin's only state park that resides on the Gitchi Gumi. Launch at Big Bay State Park's beautiful Barrier Beach and check out the many sea caves (yes, sea caves! ), clear waters, and sandstone cliffs along the shoreline of Madeline Island. While the Gitchi can be unforgiving on a windy day, the east side of the island is usually quite calm by comparison. And if you're in for a longer paddle, head north to the Big Bay Lagoon, where the waters are quite peaceful and, well, lagoon-like. Rent kayaks in La Pointe (on Madeline Island), take a tour with the same outfitter, or bring your own boat and launch from Barrier Beach. While the Dells of the Wisconsin River State Natural Area isn't technically a state park, it is managed by the Wisconsin DNR and it is, hands down, one of Wisconsin's best paddles. Launch from the Town of Lyndon boat landing and head south, taking in the beautiful sandstone cliffs and tributary canyons along the SNA. Some highlights include Witches Gulch, Roods Glen, and Coldwater Canyon. Unfortunately the DNR has leased a number of these public lands to a private boat tour company, so setting foot on the land is a no-go (as the many "No Trespassing" signs will remind you). But navigable waterways are open to the public, so sit back in your kayak or canoe seat and take it all in. After a few hours on the river, hop out at the public landing on Illinois Avenue near downtown Wisconsin Dells. Since this area is more of a popular motor boat destination, there aren't many kayak rental options, so it's mostly a "bring your own kayak/canoe" situation. But we guarantee that if you do, you won't be disappointed.